Set the meter to DIODE mode. To test N-Channel FETs put NEG(-) probe on pin 6 or 7 and the POS(+) probe on pin 2 or 3. If the FET is good you should get some value between 100 to 500 or even higher, anything less than 100 the FET is shorted. 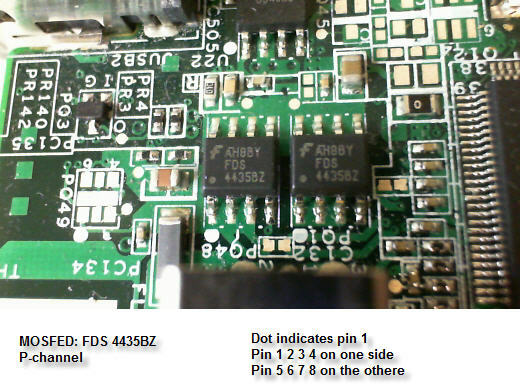 To test P-Channel FETs put NEG(-) probe on pin 2 or 3 and the POS(+) probe on pin 6 or 7. If the FET is good you should get some value between 100 to 500 or even higher, anything less than 100 the FET is shorted. Odd number MOSFETs are usually P-Channel even numbered N-Channel. Make sure the CPU is removed or many n-channel fets will read shorted.